A third (34%) of drivers are still using their mobile phone without a hands-free set, with more than half a million motorists admitting to making calls on almost every journey they make. 43% of drivers did not know that the penalty for using a hand-held phone is six points. The study from Kwik Fit found more than a quarter (26%) of drivers use their satnav or GPS on their phone, while almost one in five say they take calls (19%) or read text messages (17%). One in six (16%) make calls without a hands-free set, with around one in eight (12%) sending texts. The research also found that millions of drivers don’t know the rules for using phones. More than two in five (43%) do not know that the penalty for using a hand-held phone when driving is six points under the newly introduced penalties and only 47% are aware that those caught using a hand-held phone in their first two years of driving will lose their licence. Youngest drivers are the most ignorant about mobile phone rules, with those aged 18-24 nearly three times more likely than the average motorist to believe it’s legal to use your phone when stopped at traffic lights, and twice as likely to say you can answer calls but not make outgoing ones, and that drivers are allowed to use their phone in slow moving traffic. 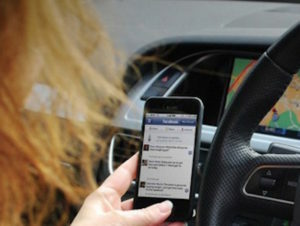 According to research for the RAC, drivers are so wedded to their mobiles that even causing an accident would not lead two in five drivers who use mobile phones behind the wheel to change their behaviour. The RAC said the findings suggest a sizeable minority of drivers still do not see anything wrong with using a handheld phone illegally because they believe they are not likely to cause an accident or be stopped by the police. The figures are borne out by recent government statistics show there been a big rise in the number of accidents resulting in serious or slight injuries where the driver using a mobile phone was a contributory factor, rising by 36% and 15% respectively between 2011 and 2015 – the last year for which data is available.